The rest of the following stuff is much older, but nonetheless still valid. The genetic code dogma has utterly failed. The first step toward properly understanding the genetic code is to realize that nobody actually understands it. The second step is to realize that the genetic code is a dodecahedral molecular language. The third step is to realize that the genetic code is so complex that it will take decades of good work to build a proper platform for actually understanding it. It will alwaysl be difficult for even the most intelligent humans to grasp the nature of this molecular language. It is not simple; it is extremely hard. It should take years not minutes to properly learn or teach the genetic code. The simple idea that the codon table is the genetic code is now nothing but a hoax. Huge mistakes have been made, and they will be difficult to correct. • What is the ideal form of a DNA molecule? It is a double helix. • What is the ideal form of the double helix? It is a dodecahedron. • What is the ideal form of the genetic code? It is also a dodecahedron. As important as the double helix was toward understanding DNA, the dodecahedron is equally important toward understanding the genetic code. Perhaps more so. The difference is that DNA is relatively easy to understand and the genetic code is not. A bigger difference is that the men of science deperately wanted to know the shape of DNA but they refuse to believe that the genetic code actually has a shape as well. Sometimes science behaves badly. This is merely one of those times. Perhaps the best way to begin to understand the many concepts behind the perfect code theory is to make side-by-side comparisons with the standard model of the genetic code. At the end of the day, one must chose one or the other as the proper way of knowing the genetic code. Molecular information involves structure through time. Two codons mean two amino acids – think two neurons. Two codons mean the relationship between two amino acids – think one synapse. Stores uncompressed information and compresses it during translation. Stores compressed information and decompresses it during translation. Inconsistent with larger patterns of evolution. Consistent with larger patterns of evolution. Fully integrated with concept of natural selection. I have been contacted by people from all over the world, and my ideas have already been taught in one form or another in high school, undergrad and at graduate levels. Unfortunately, there currently is no easy way to grasp and communicate the concept of a complex, non-linear, multi-dimensional genetic code. Conversely, it is all-too-easy to teach the flawed linear model. Once one is ready to accept the fact that we do not know or understand the genetic code, one must search for ways to better understand it. Perhaps the biggest of all ironies is that the codon table provides the best insight. I believe that I have invented the "best possible codon table." Here is my explanation of the codons and codon tables: The G-Ball, A New Icon For Codon Symmetry and the Genetic Code. If you intend to read one thing posted here, I think I would read that. It was originally a chapter from Book #4, but I greatly expanded it and posted it to an online science archive. I don't think anybody really wants to or needs to read all this stuff, but I'm keeping it all up here and available in case somebody might find something useful or entertaining. We have a serious problem when it comes to the task of understanding the genetic code. The biggest part of the problem is in convincing people that the genetic code is entirely misunderstood. So, the first step toward solving the problem is to realize that there is a problem. I argue that the dogma regarding the genetic code is: The Worst Idea in the History of Science. This is a chapter from Book #4. People always ask me what use there is for my ideas. I will answer with a famous question put forward by Ben Franklin: What use is a newborn baby? Apparently most people see no inherent value in being right. One of the things that strikes me most is the difference in the questions that are asked by the standard model versus a new paradigm entirely, so I wrote this: Please Judge Me First by the Questions I Ask. Here is a paper that first describes the nature of the problem with the standard dogma, and then it takes some tenative steps toward building a platform to correct it. One must first realize how entrenched the failed dogma has become not only in our thoughts but also our language. It is going to take decades to rip out the failed ideology and install a healthy new one: Four Laws of Biology Used to Locate the Genetic Code. Once one realizes that we don't know the genetic code. A dodecahedron goes a long way toward building a platform to actually understand it. This paper , I think, helps quite a bit in that regard: What is a Dodecahedron? I was contacted by the daughter of a Russian who had similar ideas. She sent me one of his papers, unfortunately it is in Russian, but you can clearly see the similarities. 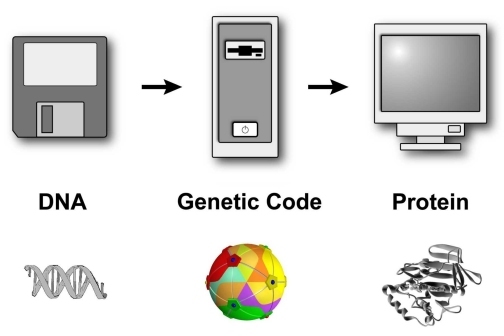 Here is a paper that reviews the basic problems of understanding the genetic code and offers a few simple solutions: What is a Protein? In a similar vein, here is a brief paper about the basic logic organizing the genetic code: Why Three? Here's a brief one arguing for a new approach: The Math of Life. One of the biggest problems that I have run into again and again is that the current language used to describe the genetic code is so disfunctional that it prohibits any real understanding of the real genetic code. I got involved in a dispute with a professor trying to teach my stuff to some students, and he objected to my casual use of the words "peptide bond." Specifically, he said that I was using the term inappropriately and that I needed a new word for what I actually meant. I responded to him with this: Nomenclature. This led me to the conclusion that the whole language needed to change, and I described an idea about how to change it: Biocalc. Several of the other papers above were derived from this. Here are some other random writings: Bio-Information, and The Problem With Language. Here is one that tries to frame the genetic code within the general context of basic language: The Language of All Languages. This effort is a work in progress, and progress has temporarily come to a halt while I go play golf. I am going to leave the following links up for amusement, but they are dated and probably not very helpful. Peruse them at your peril. How much genetic information gets into proteins?